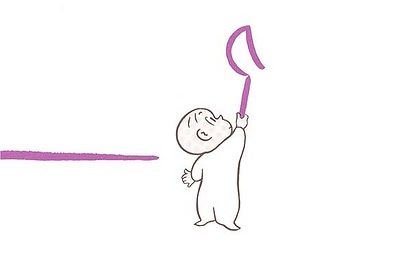 There's this book, Harold and the Purple Crayon, that I just obsessed over as a kid. It's the story of a boy named Harold and the namesake crayon, and how one night he decides to go on a moonlight stroll. But there's one small dilemma: he lacks a moon. So how does he solve his problem? Well, Harold simply goes and makes a moon using his crayon. He continues to sketch himself into all sorts of adventures, like accidentally doodling an ocean and scribbling an emergency balloon mid-free fall. Harold keeps scratching his own itches and solving his (mostly self-concocted) problems using nothing more than the wax tool at his disposal and a bit of creativity. The book has a simple premise, but something about it just kept me reading ad infinitum. I was stuck to it in that wonderful way kids can repeat something endlessly without any diminishing amusement or happiness. Why? Because The Purple Crayon is, at its heart, a book about building things. About taking some idea in your head, something you want exist in the world, and making it happen. And by using the lowly crayon, rather than a computer or mechanical tools or complex math, it makes a kid feel that they really can create something. It's a glimpse of a world where your ideas are just one step shy of tangible. But timing is everything: published in 1955, the book predates the web and all of personal computing by a couple of decades, and even beat plastic interlocking Legos by a couple of years. As a kid the 1950s, solving your own problems was decidedly a game of imagination over implementation: you could draw, write, and talk about what you would make all day long, but actually crafting something useful was pretty much left to the grown-ups. Then along came computers. Coding democratized how we can solve our own problems, regardless of age. By the time I was toddling around, building websites in elementary school wasn't uncommon; when I got older, teenagers were starting companies in their dorm rooms that would grow into generation-defining entities. So maybe the radical notion of a kid creating a moon, or at least space travel, isn't so far-fetched: it's just that we'd be using a Purple Keyboard. If you want something to exist, all you need might be a little leap from crayons to code.